There are a total of 50 Spaceship Parts to collect in GTA V to unlock the "From Beyond The Stars" Achievement/Trophy. In order to start collecting these, you have to finish the mission, Fame or Shame. 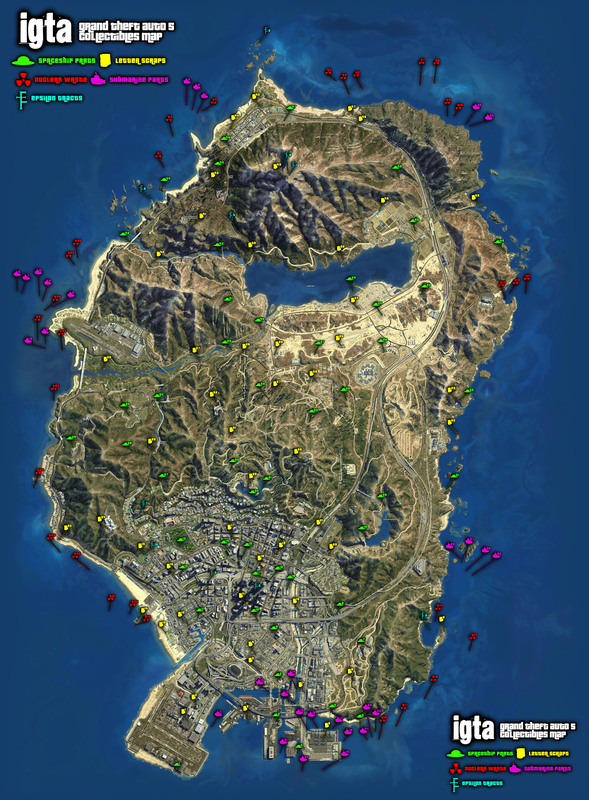 While playing as Franklin, there should be a question mark on your map in Sandy Shores. You will meet a strange fella that goes by the name, Omega. He wants you to collect Spaceship Parts from a crashed UFO. It doesn't matter which character you use to collect them after initiating the quest. Trevor's piloting skills do come in handy on some of them so keep that in mind. So without further delay, let's get right to it! CLICK ON THE IMAGES for a better view. And CLICK on the image to the right to see the entire map of collectibles. Behind the Hangars on the Southermost part of the Airport. Right next to the Watts Towers. On top of the pipe that connects 2 giant tanks at this location. The part is underwater. Can't miss it if you're near the spot on the map. On top of the middle rock structure in this area. Inside a green shipping container. It's in the middle of a catwalk above the water. On top of the Hospital, next to the helipad. Underneath the highway, in the Hobo Town. On the top of the Vodka Billboard on top of Liqour Hole. On top of a building at the movie lot. Use large staircase in the middle next to all the cameras. At the Golf Course, on the island in the Southernmost pond. In the empty pool on the rooftop. Use a Helicopter or Parachute in. Approaching from the East, take the left under the building. The part is by the bushes. Grab a Helicopter, it's on top of the Penris building. This one is in the underground tunnel. Use the entrance a block west on the Highway. Down a Market Street, next to the Bean Machine. At the bottom of the giant pipes. On the Northern side of the arch. Underneath the surface, in the Northeastern end of the cave. At the top of the Hippie Rock. Underwater, in the middle of the Bay leading out to the Alamo Sea. On the West Side of the Rock Formation. Climb the Satellite on the West side of the group. In front of the Weclome Banner. At the bottom of the Cliff right next to the road. Get a Helicopter. Land on top of the Circular Tower. In the water, right near the center of the Dam Wall. Next to the Dome on the East side of the Observatory. On the South side of the Bridge, at the foot of the Waterfall. Down a Row of Grapes. Approach from the East. Follow the Stream from the road on the East. Look for a Cave on the North Side of the Steam. Next to the Tree in the Center of the Parking Lot. Near the peak on the first set of Cliffs in the area. Get in a helicopter and SAVE by the bridge. This could take a few tries to parachute onto the arch under the bridge. Aim for a lower opening and walk up to the part. On top of the Giant Rock. Underneath the Bridge on the Dirt Path. On the Third Story of the Structure. Inside the Barn at the Marijuana Farm. Inside the Barn with the Boat next to it. In the middle of the Cow Pasture. After collecting all of the parts, a new Mission will pop up called, "The Final Frontier". At the end of the cutscene, Omega leaves you his modified BF Injection, the "Space Docker", as a reward for collecting all of the Spaceship Parts.